It happens a lot, the recognition that things are not quite the way we think they are. It's not difficult to misperceive a situation. Humans are constructed in such a way that we rarely pay close attention to information coming directly into our sensorium. Instead, mostly we work off of mental maps and representations. Ideas about experience, rather than first-hand experience. It's a funny shortcut our brains take to deal with the constant flood of sensory information. Combine our brain's constant cobbling together of the world with a collage of previous experience, upbringing, education, cultural messages, advertising images and our own chatty internal dialogue — and you can see how easily we can misperceive the truth of a situation. We sometimes need a reminder to bring us present to the depth and breadth of a situation, a wake-up call that says we’ve left something out. Perhaps something essential. Something that clarifies our view, like cleaning off smudged glasses or noticing that we've transposed numbers. Recognizing we’ve been mistaken is just that reminder. “Mistaken” is gentler than “wrong,” with its judge's gavel bang of guilt and gravity. Mistaken gives a bit of breathing room. Not room to wiggle out of our responsibility, but to more deeply inhabit our side of the situation. To own our narrow or self-centered views, feel our missteps and see how our actions and decisions have unfolded a story of pain, limitation or confusion. Mistaken gives us a chance to grow. It engages the process of learning, opens the possibility of forgiveness and gives a chest-expanding sense of relief as understanding unfolds and allows the constraint of conflict to dissolve with a liberating breath of release. Mistaken allows the sidestepping of the wars of escalation that come from the burden of avenging or holding up a wall of resentment and anger that demands retribution and amends, or at the least, justification and teeth-gritting vigilance. Chronic pain is a curious phenomenon. It is partly based in our physiology — in structural aspects of bone, tendon, or muscle — or caused as a result of nerve impingement or curious quirks of how the brain continually fires nerve impulses long after an injury has occurred. Simple pain usually resolves quickly. Chronic pain is another matter all together, especially if there are physical changes or deterioration. Once someone has been referred to “pain management,” it usually means occasional injections and a steady stream of drugs, with the goal of making the pain more bearable. Of course, if you have been referred for pain management, you already know the prognosis is usually not so good because the goal is control, rather than cure. This is a time when many people turn to acupuncture. It can be helpful, but here are a few things to keep in mind if you want to use acupuncture to help with your chronic pain. First, acupuncture will not change structural abnormalities in your body. Stenosis, arthritis, herniated discs or bone spurs are not going away. However, acupuncture can help your body find a way of “rewiring” around that problem. How does it do this? The answer lies in the brain’s way of being able to rewire itself. Often, you can see the results in changes in posture or increased mobility. Secondly, have realistic expectations. 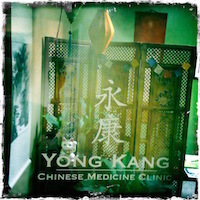 Acupuncture is medicine; not magic. And while some people experience dramatic relief, it’s best to think of acupuncture as part of your pain management process. Pain pills can give a few hours of relief. Sometimes, acupuncture gives days or weeks of increased comfort. If you are looking for a one-and-done solution, you may be disappointed with acupuncture. On the other hand, you wouldn’t say pain pills failed because the pain returned after they wore off. If you turn to acupuncture for pain relief, don’t expect miracles — but do expect improvement. How will you know you are improving? This might seem like a strange question. After all, it hurts or it doesn’t, right? Well, it's not so simple when it comes to chronic pain. To chart improvement, it helps to track your activity levels over time. For example, you love to garden and you used to spend all afternoon out there. With your chronic pain, perhaps you had to give that up. But with some acupuncture, you now can work in the garden for 30 to 60 minutes at a time. That counts as improvement. If you can reduce the amount of pain meds (and the side effects they bring), that too is movement in the direction of improvement. If you pay attention only to how you feel (and how you think about how you feel) right now, you may miss the trajectory of how you might be improving over time. Acupuncture rightly has a reputation for being helpful for pain. But remember, just as you need a steady diet of nourishing food or adequate rest for vitality, acupuncture is most helpful for chronic pain when you add it as part of your on-going self-care. 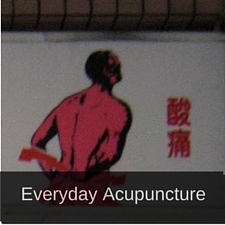 Listen in to a discussion of acupuncture and chronic pain over at Everyday Acupuncture Podcast. When Tracy first wanted me to taste “raw vegan” ice cream, I thought I’d humor her.Years ago, I remember being told I’d enjoy carob, the “healthy” chocolate substitute. I didn’t. Swapping Postum for coffee was another really bad idea. And I remember trying a so-called “ice cream alternative” in the past that tasted as though it were made of soy and cardboard. Let’s face it. There is no substitute for some things. However, this nut-based “ice cream” is worth a try. It’s not the same as Haggan Dazs or Ben and Jerry’s. But it is cool, velvety and smoothly delicious. 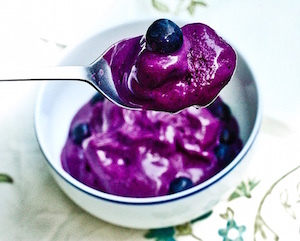 It’s certainly worth a try if you have issues with dairy or want to cut down on sugar. Here is a basic recipe you can freely experiment with, adding your own flavorings. I bind the wound, God heals it. decided to cut back on sugar. When you first begin to step away from sugar, the first (and often most startling) discovery is that the vast majority of food you eat either contains added sugar or the ingredients are quickly converted to sugar by your digestive system. Something as simple as feeding ourselves suddenly feels like an uncharted wilderness. And indeed this is a journey of discovery. While we are inundated with references to good carbs and bad carbs, the key is recognizing how the foods we eat affect our blood sugar levels and the corresponding fluctuations of insulin. To address the question more directly, here are pointers from participants who recently completed the 45-day “Journey Beyond Sugar” program. • Your taste buds really change once you get off over-stimulating and addictive sweeteners. But it takes some patience; it won't happen instantaneously. Get the junk out of the house so you won't be tempted. Eating plenty of greens, vegetables, and beans will fill you up and make the transition quicker by providing the phytonutrients your body needs. • The most important thing is to get rid of refined sugar. I eat lots of nuts and seeds. • I am still struggling with this myself and it was one of my concerns at the beginning. I think the answer is to eat only vegetables with a little meat. • What are your favorite vegetable dishes, besides potatoes? Eat that every day! • List the most common foods (include snacks) that you eat. Start by picking one, and find a slow- or no-carb replacement for it. Then continue moving down the list. • Start with things you already know you like and that are “ok” to eat and build from there. Slowly explore and add in new foods, and don't be afraid to try new things. Think of food primarily as a source of fuel and not strictly a pleasure-generator. Do you want to join the others who are changing their relationship with sugar? Get the skinny at Beyond Sugar. Wholeness can be appreciated directly when the mind is still and neutral, then reality can impress itself upon us. If our observer is active, it keeps us outside of the stillness…and wholeness is always beyond our reach.